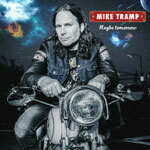 The former White Lion and Freak Of Nature vocalist Mike Tramp brings forward another chapter in his long career. A lot of old fans would definitely love to see a resurrected White Lion with Mike and his former companion Vito Bratta since they were such a cohesive pair back in the day when they created unforgettable songs on the too few records they made together, but since that's not going to happen in this lifetime, unless Vito would much unexpectedly return to music again, I guess that Mike's solo efforts will still be the closest thing to the past that the fans will ever get from those guys. Don't expect any heavier stuff at all on Maybe Tomorrow and besides some placid ballad material most of the songs follow a specific thread over the record, where the general delivery is pretty much easy fetched light rock music with emphasis on the electric guitar with acoustic settings. Mike neither tries to invent a new design to his music with this record, nor does he add any complex stuff not needed to it, but simply just further builds on what he has developed over the years without losing his credibility. The Danish singer and guitarist truly makes the songs he wants to come out with today and his vocals are emotional with words right out of the inner core of his own being. He is certainly a man full of expression and he carries the ability to create attractive vocal melodies on top of a relaxed musical foundation, even if exactly everything doesn't click on a large scale over the record. His tone of voice is pretty much at the same level as it has always been at, even if it naturally changes along with aging and to be honest he also plays it pretty safe for the most part on this record too.